Date Added: Wednesday 10 April, 2019 by Arno D.
Amazing item! The shirt arrived within a reasonable timeframe. I ordered large and it fits nicely. Great quality and craftsmanship! Excellent addition to my future ANH Han Solo!.. Date Added: Friday 22 March, 2019 by AJ L.
I've been wanting one of these shirts since I was a kid. This version is EXACTLY what I hoped it would be & more! There are a lot of cheap versions of this shirt out there on Etsy & Ebay that are made from the wrong materials, but this one is SO PERFECT! And is so reasonably priced!!! You can't beat this! It fits so damn well and is the exact right feel and cut. I love it so much!!!!!!!!!!!!!!!!!!!!.. Date Added: Monday 04 March, 2019 by Jake L.
Date Added: Wednesday 27 February, 2019 by Max F.
Date Added: Wednesday 13 February, 2019 by Stuart T.
Falcon shirt arrived in UK only a few days after dispatch from NZ - I am very pleased with this! The quality of the material and workmanship are fantastic & have far exceeded my expectations. 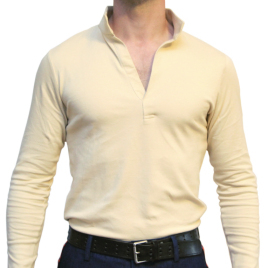 Fit is excellent - I am around 38” chest and ordered a small, fit is seen on the model on the website photos - although I have purchased as an everyday shirt, rather than for costume; you may want to go a size bigger for a screen seen fit. Thank you Magnolia clothiers, I will definitely order again I the future!.. Date Added: Monday 11 February, 2019 by Simon B.